Big Walnut’s Carson Becker waits for the ball before tagging out New Albany’s Spencer Tammaro (21) at second base during Friday’s OCC showdown in Sunbury. 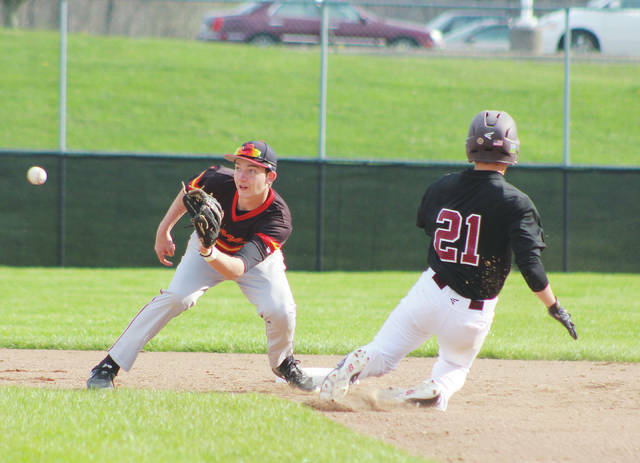 The Big Walnut baseball team “did the little things” as head coach Jack Schone put it, using a pair of squeeze bunts to score both runs in a 2-1 win in nine innings over New Albany Friday night in Sunbury to create a first-place tie between the two squads atop the OCC-Capital standings. Cale Sherbourne’s squeeze in the seventh scored Zach Rines to send the game to extras before Nathan Lawyer led off the ninth with a double – the game’s only extra-base hit – before scoring on JJ McLean’s squeeze bunt for the walk-off win. “I got a fastball that I liked and went back-side with it, and it was right where it needed to be,” Lawyer said of his hit. It wouldn’t be a Big Walnut-New Albany game if it didn’t go to extras. The teams set a state record with a 22-inning marathon that spanned three days in 2015 and needed two days to complete a nine-inning affair earlier this season. This one seemed to be heading that way. Down 1-0, Sam Medley and Colton Lee led off the BW seventh with singles. Lawyer sacrificed the duo over before Noah Sprowls was intentionally walked to load the bases. Rines, who pinch-ran for Medley, got a good jump and Sherbourne did such a good job getting the bunt down on the first base side, that the New Albany defense couldn’t make a throw home. No way that could work twice, right? The runner at third could mistime his jump and be easy pickings for the defense. The batter could miss, leaving the runner hung out to dry. But, Lawyer got his jump and McLean did his part – bunting it back to the pitcher, who flung it home in vein as Lawyer had already slid home by the time the ball got there. It’s almost a shame that it didn’t go 22 innings and span three days. It was a quality game. Neither team committed an error, there was one wild pitch and one hit-batter and both starting pitchers were pitch-efficient and went deep. New Albany starter Kevin Fee went six-plus innings and spread around nine hits, three walks and a hit batter. He struck out four and was charged with one earned run. Parker Thompson had three hits for New Albany (14-6, 9-2), including a leadoff single in the fourth. He moved to second on an Ethan Swincicki sacrifice bunt and moved to third on a single by Fee before scoring on an Alex Arenschield groundout to break the scoreless tie. Lee, who started on the mound for BW, was masterful in his part and even lobbied to stay in the game in the eighth. He got a pair of groundouts before Thompson sent one right at his feet that just got through and into center field for a hit. Schone wasted no time in bringing in Wes Coey, who got a strikeout to end the inning. Coey got the win for BW (11-8, 9-2), allowing a hit in the ninth. Lee allowed an earned run on six hits and a pair of walks with six strikeouts over 7.2 innings and needed only 103 pitches (67 for strikes). Lawyer and Medley each had two hits to lead BW. Arenschield took the loss for New Albany. He allowed an earned run on three hits and four walks with a pair of strikeouts over 2.1 innings of relief. The two teams are – as it should be – deadlocked in a tie for first place in the league with four games remaining apiece. BW opens next week at Newark Monday at 5 p.m. and has a pair of games against Groveport-Madison sandwiched around a meeting with Franklin Heights. New Albany has Groveport and Franklin Heights before closing with back-to-back games against Canal Winchester.